In April 1994, Renfe-Talgo of America was awarded a contract by the Washington State Department of Transportation (WSDOT) to lease a Talgo trainset for operation in the Seattle, WA to Portland, OR corridor for six months. In October of 1994, showcase runs of the Talgo rolling stock were performed for railway authorities and technical experts in Oregon, California, Missouri, Ohio, Pennsylvania, Massachusetts, New Haven and Maine. The contract with WSDOT was also renewed to continue the lease of the Talgo TP 200 trainset in the Pacific Northwest corridor. As the project proved to be very successful, in July of 1996, WSDOT and Amtrak placed an order to buy three new Talgo TPU™ trains (two WSDOT and one Amtrak) and to lease one additional train (Amtrak). These were assembled in Seattle using American workers and skills. The new Talgo's started service in January 1999 and are operated by Amtrak under the Amtrak Cascades brand name. A fifth trainset was manufactured at the same time as the four previously mentioned. This trainset was scheduled to enter service between Los Angeles, CA and Las Vegas, NV in early 2001, but was sold to WSDOT in 2003 and is currently in use on the Eugene to Portland, Oregon Corridor. So far, the operation of these trainsets has been a tremendous success. Ridership has continued to increase, travelling times have been significantly reduced, and the entire corridor has been revitalized. 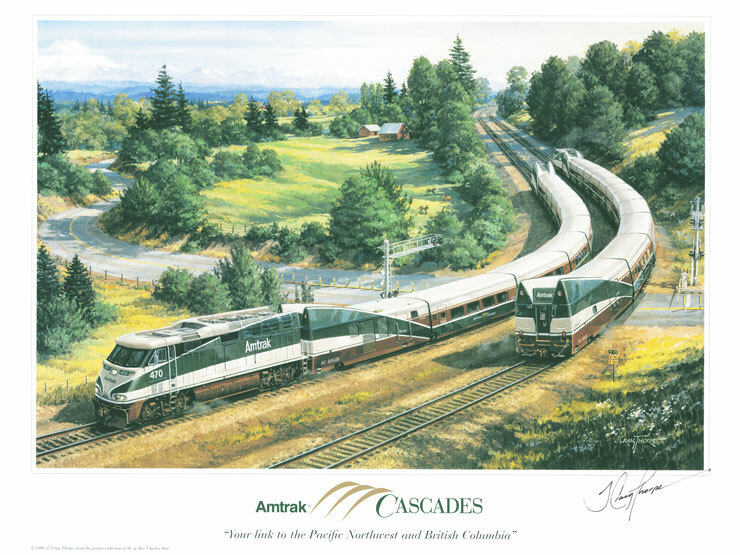 In 2009, Amtrak Cascades celebrated their 10 year anniversary and has carried more than six million passengers since 1999. 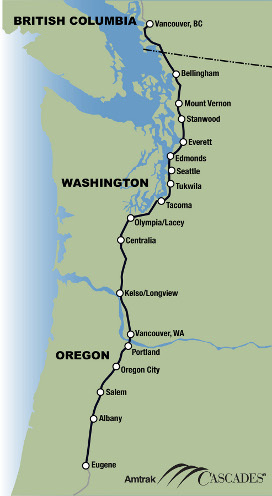 The success of the Pacific Northwest Project is the result of a good partnership experience among Talgo, Amtrak, WSDOT and Burlington Northern Santa Fe (the owner of the track). From the Talgo side, the key for success has been the design of the trains, including the many amenities available, such a individual electric outlets for laptops, wheelchair lifts on ADA cars, individual audio-video outlets; the quality of the ride and the great reliability that is assured by the application of Talgo's integral maintenance system.